01. How long it took you for this transformation? -My gym membership with Macao Fitness was back in 2012. At that time I was a swimmer, and I hired a personal trainer Amy Ridge. -I built her idea of fitness training (work full parts of body) from scratch. -It was not until last year May 2017 that I came back to Macao Fitness and met another female trainer Anca, it was then my journey kicked off. 03. 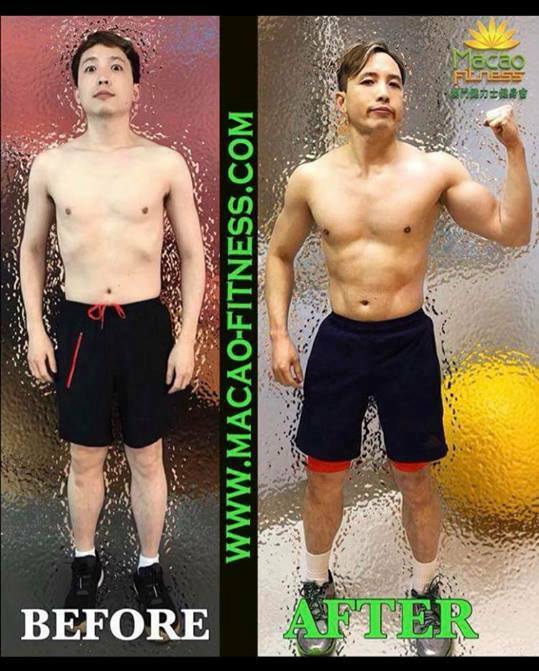 How has Macao Fitness, and Anca helped you throughout your journey? -Anca is my coach and instructor in Macao Fitness community. She helped me focus on my goal, always with me every step of the way ( and recently her husband Keno too) and guaranteed satisfaction. One more thing: friendship. I like Macao Fitness because the gym builds my path to success: fully equipped facilities, a private fitness centre, members sharing my aspirations. Everybody needs time, space and dedication to train quality fitness, and Macao Fitness provides exactly these. 04. How is your training schedule? how many times per week you train and what body part you train? 05. What’s your typical day diet? how many meals?